Wartburg College is the second private school in the Midwest and ninth in the nation to achieve a gold rating under the newest version of the Sustainability Tracking, Assessment & Rating System (STARS). Wartburg is the first Iowa private college to earn this honor. 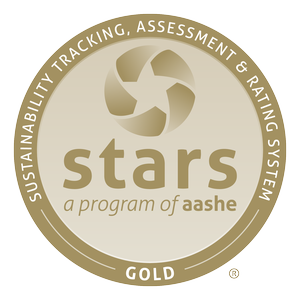 STARS, a program of the Association for the Advancement of Sustainability in Higher Education, launched in 2010.STARS 2.0 ratings are based on scores in nearly 75 categories encompassing academics,engagement, operations, and planning and administration. Since 2009, Wartburg has supported a community garden. All produce goes to Dining Services to be incorporated into meals. The garden is sustained with volunteer support. Dining Services buys nearly all food locally so farmers can reinvest their money into their own community. Buying local also helps the environment as it reduces travel expenses found in supermarkets. Wartburg has water bottle fillers located in Science Center, Luther Hall, Saemann Student center and Vogel Library to reduce waste. During construction of the Wartburg-Waverly Sports & Wellness Center in 2007, the college partnered with the local energy utility to fund a wind turbine that offsets the facility’s energy consumption. The Mensa Dining Hall is tray-less to reduce water, energy, and food waste. The facility also uses front-loading washers, which saves 14,976 gallons of water every four days. Wartburg College hired Schneider Electric, an energy consulting firm, to implement a $2.4 million energy efficiency project. Overall, the project is projected to save $270,000 annually in utility costs. Residence halls and academic buildings have low flow toilets and shower heads. In 2014, an overhaul of the waste management process led to decreased landfill collection. Waste containers were retrofitted into recycling-waste sorting containers, and employees are responsible for bringing the contents to bins placed near each office. Wartburg College hired Schneider Electric, an energy consulting firm, to implement a $2.4 million energy efficiency project through utility improvements. One-third of the estimated cost of the project was funded by a grant from the state Office of Energy Independence through a U.S. Department of Energy program. Overall, the project is projected to save $270,000 annually in utility costs. 64 toilets in the residential bathrooms and 38 toilets in academic buildings were replaced with 1.28 gpf toilets. 24 toilets in Afton Manor had their flush valves retrofit to 2.7 gpf. 12 urinals in academic building had valves retrofit to low-flow specifications. 307 sink faucets in residential buildings and 198 sink faucets in academic buildings have been replaced. 175 showers in residential shower rooms have ben retrofit with 1.25 gpm massage type, non-tamper resistant showerheads. Showers in Wartburg-Wellness Center have been retrofit with 1.5 gpm showerheads. A flow control system has been installed on the Pot Wash garbage disposer in the Main Kitchen. These upgrades are expected to save around 6,500 gallons of water annually. New motorized isolation valves have been added to the Science Center. The boiler’s new motorized isolation valves reduce the required pump horsepower, the amount of hot water flow (gpm), and thus will reduce the amount of natural gas that the boilers use, by reducing the number of boilers in operation. A new heat recovery chiller has been installed in the W. Heat recovery chillers preheat water with heat produced by cooling the cold water line. The boiler in Luther Hall and Neumann Auditorium was replaced. The new boiler has an energy efficiency of 93%, as opposed to the current boiler which has an energy efficiency of about 65%. An estimated170,000 therms or 17,000 MMBTU’s are anticipated to be saved from these improvements. Motion sensors for lighting were installed into each building timed to shut off after 10 minutes of inactivity. New energy management systems were installed to insure heating, ventilation, and air conditioning are operated efficiently, yet provide comfort conditions in areas when occupied. During unoccupied hours, the systems will monitor their assigned areas to determine how to efficiently run heating, air conditioning, and ventilation. Maintenance staff installed photosensitive lighting, or lighting that recognizes if it needs to be on or not by the amount of light that is already present in a space. These improvements are estimated to save 1,600,000 kWh of electricity and 1,900 kW of power. If you are interested in getting involved with Wartburg's sustainability efforts, email sustainability@wartburg.edu. BEING A GOOD STEWARD OF OUR NATURAL RESOURCES. WORTH IT.